Phillipa Robateau headed to work on Gladeside Avenue in Mattapan last week. Just as the old aphorism predicted, March came in like a lion. Unfortunately, it was a 2,000-pound sea lion, splashing around in the murky flood water in your basement. And the sea lion is not going out lamb. In fact, that’s not a lamb at all. It’s every lamp in your house. The coastline is getting pummeled. Hundreds of thousands lost power, and some still don’t have it back. The Harvard Sailing Center pulled a Virginia Woolf into the Charles River. And now we’ve got another — hang on, am I reading this right? — another 12 to 24 inches of snow on the way. The latest addition to the Merriam-Webster’s dictionary, “dumpster fire,” came just in time. 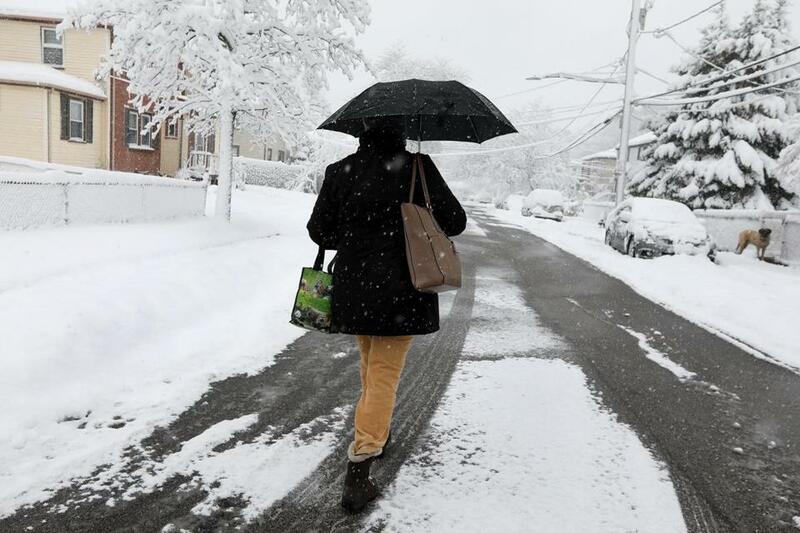 After talking with the National Weather Service, the Globe’s Christina Prignano laid out the best- and worst-case scenarios for the storm. An invaluable journalistic service, and also one that I would not read at gunpoint. The worst-case scenario? We already know the worst-case scenario, because it literally happened last week. The best-case scenario? The best case scenario is that you’re hallucinating this whole thing and you’ll wake up in Pensacola (sunny and 65 Tuesday). That’s how bad it is: The most positive possible outcome involves a battery of brain scans and a trip to the Florida panhandle. As of Monday morning, “worst case” appeared to be the likely outcome. Tuesday morning’s commute will see “near impossible travel conditions,” according to the National Weather Service. Winds will reach 50 miles per hour. Snow will fall at a bonkers 1 to 3 inches per hour rate. By noon, the weather service had gone full blizzard warning on us. Fine. Whatever. We give up. Up your game, Dave: Bring on the Skull With Rats For Eyes Death Blizzard or whatever. The good news is that we’ve got some time. The snow won’t start until around midnight, which gave us all of Monday to get ready. Not in the bread-and-milk/gas up the snowblower/make sure the oil tank is full sense. We just did all that Red Cross checklist stuff before the last nor’easter, and the bread and milk haven’t even spoiled yet. What we’ve got is even better: Enough time to psychologically prepare. Call it the cram before the storm: We’ve got time to cut out of work early and enjoy that extra hour of 38-and-cloudy sunlight. Time to eat a sandwich on a bench outside and pretend your fingers aren’t freezing. A few sunny hours to open a bunch of browser tabs and cross-reference flight prices and Tuesday high temperatures (the best option for a last-minute escape, on a dollars per degree basis, appeared to be a $483 flight to 68-degree Houston). I wandered around downtown Boston on Monday morning looking for people enjoying the city’s last hours of habitability for who knows how long. But what I found was not frolicking. It was, in fact, fairly miserable — a city full of people resigned to their fate, hands stuffed into their pockets and collars pulled up against the cold. At least a few people had the right idea. Joey Delaurentis, 28, took a load off on a bench on the Common around noon. “Just enjoying the calm before the storm,” he said as the sun came out. He was expecting a few days indoors, but hopeful that by the weekend the winter would be a memory, the 2 feet of snow melting in time for the St. Patrick’s Day parade. “There hasn’t been a real cobra clutch on us yet,” he said, and held up his hand like the head of a snake (maybe that’ll be next year’s nomenclature). Come on, Boston. We’ve only got a week of winter before we evict that sea lion. The cupboards are stocked and the shovels are ready. The snow doesn’t start for nine hours. Let’s all go get a sandwich.